JUST BEAUTIFUL - CLEAR & BRIGHT. GENUINE CASED, MOUTH-BLOWN, HAND-CUT, 24% LEAD. JUST A FLICK OF THE FINGERNAIL GIVES IT A BEAUTIFUL 6 SECOND RING. 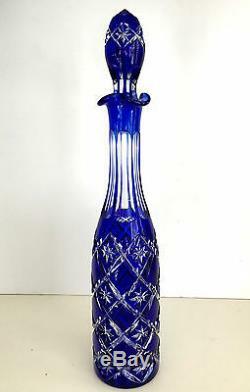 The item "VINTAGE BOHEMIAN COBALT BLUE CASED CUT TO CLEAR 16 1/2 DECANTER" is in sale since Saturday, November 25, 2017.